When I learned Detective Jose Morales would be the last witness called by Daniel’s defense team, I was particularly curious to find out how one of the lead detectives against Daniel was now supposedly going to help him. I knew we weren’t going to get some kind of bombshell moment. Things like that happen during the guilt phase of a trial, and I didn’t expect Det. Morales to say anything that would call Daniel’s guilt into question. At this point, Scott Sanders was just trying to save Daniel Wozniak’s life. During the guilt phase of the trial, Lead Detective Lt. Ed Everett made it abundantly clear he believes Daniel’s former fiancée, Rachel Buffett, should be facing the same murder charges as Daniel. However, during Det. Morales’ time on the stand, Scott Sander’s didn’t ask any questions about Rachel during his cross-examination. Still, I was anticipating a, “hey look over there at Rachel Buffett” approach now that we were in the penalty phase. I was right. First thing out of the gate was a question about Rachel’s own police interview. Det. Morales was asked if he’d been part of Rachel’s questioning. He had. In fact, Detective Morales interviewed Rachel many times between 2010 – 2012. I got the impression that he doesn’t have the same access to Rachel now. Maybe a lawyer put the kibosh on her talking to the police? During questioning, Rachel had been repeatedly asked when she had found out about Julie’s murder. She always claimed to have learned about Julie death when everyone else did: after Steve Herr found her body in Sam’s apartment on May 22. But Detective Morales confronted Rachel with the fact that there had been people at the theatre who’d heard Rachel speak about Julie’s murder earlier on that weekend. During his testimony, Det. Morales revealed that Rachel lied to the police about her knowledge of Daniel’s money issues. She’d claimed not to know who’d loaned Daniel money. She thought he’d borrowed from a loan shark and that Daniel was afraid of “having his legs broken” if he didn’t pay it back. Scott Sanders led Det. Morales to tell the jury that he’d confronted Rachel. He knew it was Chris Williams who loaned money to Daniel, and he knew she knew. Why did Rachel not tell the police about Chris Williams loaning money to Daniel? Early in the investigation, Rachel stuck to the story that some “bad people” were involved in loaning Daniel money and Rachel was afraid of them. In a 2012 interview, Rachel told the police that she’d kept Chris Williams’ identity a secret in order to protect his name. But during Williams own testimony, he told the jury that Rachel knew there were no loan sharks. So why had Rachel lied to the police about having a fear of them? Scott Sanders questioned Det. Morales about Chris Williams’ cell phone movements on the day of Sam’s murder. Williams left Rachel and Daniel’s apartment soon after Daniel, having just murdered Sam, arrived home that day. The jury was reminded that Rachel called Chris Williams not long after he left the apartment, and she was very upset, but didn’t say why. Next, Det. Morales was questioned about the timing of internet activity at Daniel and Rachel’s apartment that day. I think the purpose of this was to show that Rachel was online when Daniel wasn’t home. Scott Sanders didn’t link this to any of the incriminating searches that were used as evidence during the guilt phase. So why is it important that she was on the computer when Daniel wasn’t home? Oh, and by the way, the reason the police know Daniel wasn’t home: because that was when Sam was being murdered. Rachel originally said she didn’t know what time she went to bed on the night of Julie’s murder. But later, she gave an exact time. Rachel signed on to Daniel’s Facebook account during the weekend of the murders. He didn’t seem to believe her when she said this was common for her to do. Rachel claimed she didn’t notice Daniel using a flip phone to send texts to Julie on the night she was murdered, even though Daniel owned a smart phone. Some of those texts were “eerily similar” to statements Rachel made to the police during interviews. Why All The Attention On Rachel Buffett? So what was the point of all this, and did we learn anything new? At one point it was mentioned Daniel had made three calls to Rachel from jail (only one was played for the jury). I don’t think I knew that before, but I don’t know if it’s important, either. I think Scott Sanders was trying to remind the jury that the police have doubts about Rachel. What did she know and when did she know it? Did she help cover up Sam’s murder? Was she directly involved in Julie’s murder? And was any of it going to make a difference in determining Daniel’s fate? When it was Matt Murphy’s turn to cross-examine Detective Morales, it felt like Murphy was giving Morales the opportunity to finish his sentences… as though Scott Sanders had been cutting him off. I liked that little twist where a prosecution witness was now being cross-examined by the prosecutor – even if it did feel like they were still on the same side. Murphy wanted to clear up any question the jury might have about the charges against Rachel Buffett. She is accused of lying to the police and being a murder accessory after the fact. Murphy asked Morales if he had anything to indicate that Rachel was involved with the planning of either murder. The answer was no. Det. Morales was questioned about some of Daniel and Rachel’s computer searches. But they weren’t incriminating, so I’m not sure of the point of bringing them up. They were all seemingly related to wedding and honeymoon planning: party rentals, cruise ship information, and Sandals Resort in Mexico. The searches were all done on Daniel’s laptop, not on the shared desktop. Detective Morales admitted that he doesn’t buy Daniel’s confession story, but pointed out that Daniel has always maintained that Rachel had nothing to do with the murders of Sam and Julie. Det. Morales personally believes that Daniel told Rachel about the murder of Sam and the two of them planned to cover up Sam’s murder by killing Julie. His theory is that Rachel had knowledge but she did not participate. That was the end of it. There would be no more witnesses and the jury was told to report the following Tuesday at 9 AM to hear the closing arguments. In the next post: the beginning of Matt Murphy’s closing arguments. Matt and Scott Sanders each spoke for about six hours. I have lots of notes. We were down to the last two defense witnesses, including a character witness, and I don’t know if it would have been possible to find individuals on more opposite ends of the justice spectrum. The first was Daniel Munoz, who met Daniel Wozniak when they were housed together at the Orange County Jail Intake and Release Center. They were like next-door neighbors… only in cells. The other defense witness was one of the lead detectives on the case: Det. Jose Morales of the Costa Mesa PD. I mean, I’m Daniel Wozniak’s friend, but no, I did not have an immediate positive reaction to Mr. Munoz being the one character witness the defense decided to put on the stand. Don’t get me wrong. I’m not badmouthing Munoz as a person, but him having a rap sheet as long as my arm probably didn’t do much to impress the jury. Matt Murphy made quick work of besmirching Munoz’s reputation during his cross-examination. For me, it ended up being rather ironic, because when Daniel Munoz described our friend Daniel Wozniak, it didn’t sound much different from how I would describe him. He told the jury that everybody liked Daniel Wozniak and he was always willing to help anyone who needed it. Daniel Wozniak was cheerful, honest, and generous. He would share anything he had. Daniel Wozniak never got into any fights. He never got angry or confrontational with anyone. Munoz even credited Daniel Wozniak for helping him get his own life back on track when he helped Munoz find religion. Yes, I know the “finding religion” business is a prison cliché, but that doesn’t mean it can’t be true. God and religion are very important in Daniel Wozniak’s life, so it doesn’t surprise me that these topics would come up in conversation. Munoz told the jury how you meet a lot of different types of people when you’re in jail. It seemed like he was saying this life experience gave him an ability to be a good judge of character. It’s not as illogical an argument as it might sound. Making friends in jail must have its challenges, and the inmates in Orange County are even more wary after all the information that came out in the past year. Oh, and Munoz also said that even the deputies at the Orange county jail like Daniel Wozniak. This is actually true. I’ve seen it. He gets along really well with the deputies. He doesn’t cause trouble. He doesn’t get write-ups. He’s basically a model prisoner. Matt Murphy, that just seems like a nonsensical argument considering the large proportion of inmates who have ink. Tattoos are pretty common these days, both in prison and in “the real world.” I have seventeen myself. Daniel Wozniak is probably one of the only inmates without any tattoos. I wonder if any of the jury members have tattoos..? When it was time for Scott Sanders to re-cross, he asked Munoz if there was benefit in coming to testify for Daniel Wozniak. No, there wasn’t. No deals were made. Munoz just insisted on testifying because he wanted to show the jury another side to Daniel Wozniak… the side he knows… the same side I know. That brings us to a question I’ve been asked more than once: Why didn’t I testify for my friend? I’m an upstanding member of society; wouldn’t my opinion mean something to the jury? My answer is: if I had been asked, I would have. Daniel didn’t want those close to him to testify. My personal gut feeling is that Scott Sanders might have wanted to call Daniel’s parents or other relatives to the stand. Aside from me, Daniel has numerous people who are still close to him. It wouldn’t surprise me at all if there were other people willing to testify on Daniel’s behalf. That didn’t happen, though, and I’m pretty sure it was because Daniel wanted to spare his friends and loved ones from being cross-examined. What did you think of Daniel Munoz’s testimony? Did you wonder why no one else testified for Daniel’s character? Would it have made any difference to you if there had been other character witnesses? It was an interesting choice to call one of the CMPD officers in charge of the entire case as the last defense witness. During the penalty phase, when the prosecution called Detective Morales to the stand he was mostly questioned about locations related to the crime. He’d shown the spots on a map. Morales was also the officer who took the photos of the texts on Julie Kibuishi’s phone, the ones displayed during the guilt phase. At that point in the trial, Scott Sanders didn’t even cross-examine Det. Morales when he was on the stand. Now, the officer would be the final witness in an attempt to convince the jury not to execute Daniel. That testimony will be up next on DWIMF. The penalty phase of Daniel’s trial started on January 4, 2016. Court began at 10:30 that day, and I was bundled up while walking to the Orange County Courthouse. I’d even broken out gloves and a scarf for this Californian’s version of a winter morning (I think it was 60 degrees Fahrenheit, so, brrrrrr). Or, it’s possible that heading up to the eighth floor to watch twelve people decide if my friend should be put to death made me feel cold from the inside out. The guilt phase of Daniel’s trial was all about facts. But, in the penalty phase, emotions would dominate. • A photo of Sam’s parents being handed a folded American flag: Allowed. • Soldiers carrying Sam’s casket: Not allowed. • Sam’s former fiancée crying over his casket: Allowed. • Umm, I think there was one of Sam with a puppy he adopted while serving in Afghanistan: Not allowed. Don’t get me wrong, I certainly didn’t want the jury to give Daniel the death penalty, but was one “puppy picture” going to tip the scale? Of course, people do love puppies. I love puppies. Would it have taken the jury even less time to decide on death if they had seen the puppy picture? Then there was discussion about the Google searches found on the computer from Daniel and Rachel’s apartment. The jury had already seen the searches during the guilt phase, but Scott Sanders didn’t want them to be reminded that inquiries about cruise ship amenities coincided with questions about hiding bodies. Judge Conley said the law was strict where the death penalty applied, and he ruled that the jury didn’t need to see certain information twice. I am pretty sure that no one could forget those searches anyway. Okay! Everyone… ignore the lawyers! Next, there was an explanation about the difference between mitigating and aggravating circumstances. Mitigating circumstances should lean the jury away from choosing the death penalty; aggravating circumstances are the “let’s fry him” details. So far, there hadn’t been much in the way of mitigating circumstances, so I wondered if we could expect some from Scott during this phase of the trial. The penalty phase is almost its own mini trial. It starts with opening arguments. Then there’s the questioning and cross-examining of witnesses, and it ends with closing arguments. An interesting little side note: Normally the prosecution has an opportunity to give a rebuttal after the defense closes. However, because of a previous ruling in this case by Judge Conley, the defense would actually have the last word during the penalty phase. This caused a great deal of contention for Matt Murphy, who continuously tried to fight this motion up until the end of the trial. Then, it was time to get started. Everyone was in their place. Matt Murphy was raring to go. Another side note (sorry, but this one is directed to Matt, Scott and Tracy): As a theatre director I need to tell ALL the attorneys to SPEAK UP. My goodness, you folks need to learn how to project and enunciate. Seriously. This is not meant as an insult. It’s just constructive criticism. Maybe you’re trying to make a more intimate connection with the jury. If that’s the case, you can accomplish this without dropping your volume. I’d even be willing to rehearse with any of you if you’d like. As an example, remember on Monday when we were all waiting around in the courtroom for that other case to finish? Well, I had no trouble hearing those attorneys, and they had their backs to the audience. So, just sayin’. Matt Murphy was up. He started by talking about Daniel’s life. He directed the jury to his first PowerPoint slide. But, in a rare move for the defense in this case, Scott Sanders actually piped up with “Objection,” and said he needed to address the court in chambers. Daniel was left alone at the defense table. Usually, he would just stare forward. Maybe he was making anagrams out of the letters on the seal of California. When everyone was back, Matt Murphy went back to the PowerPoint and BAM, Scott was objecting again. Some spectators scoffed at his request to return to chambers. Daniel even turned from the table to give me a quick confused glance. They returned from chambers, and the judge explained what was causing the commotion. The first objection was to some information about Daniel’s life and background contained on one of the PowerPoint slides. During the first trip to chambers, the slide was ruled inadmissible. It turns out that slide was still up on the screen when the machine was turned back on. This meant that the jury could have easily seen the inadmissible information. This could have turned into a huge ordeal, but Judge Conley wasn’t going to stop the trial quite yet. In addressing the jury, he wanted to know if any of them had seen the information on the slide. Show of hands? Then each of those jury members were brought into chambers to be individually questioned by the judge and the attorneys. After all was said and done, it was agreed that everyone could just forget whatever they saw and we could get on with our trial. So, what was on that slide? Really, it was just information about how Daniel’s background had been pretty normal. Maybe Matt wanted to point out that Daniel had no excuse for his actions, having been raised in stable family environment. And why should the defense want to want to keep this from the jury? I know that Daniel wants to protect his family’s privacy as much as possible, but it seemed like such a fuss over something apparently fairly innocuous. Rachel Buffett was next on Murphy’s agenda. He was pretty sure that Rachel would be a much-discussed topic during the defense’s arguments (she was), and if the jury was going to have any doubts about Daniel’s level of guilt, he wanted to nip them in the bud now. • Some people don’t like her (specifically certain police officers). • She was living with Daniel, and they were always together. So she must have known what he was doing. • If Daniel gained financially, then so would Rachel. • She cried onstage (during a crying scene). • She lied to the police about seeing a third man with Sam and Daniel on the day Sam was murdered. • None of Rachel’s DNA was found on the murder weapon. • Rachel didn’t borrow any money from Chris Williams. • She told Chris that Dan was a pathological liar and not to trust him. • Rachel called Detective Morales and turned over evidence to him. • She’s had steady employment at Medieval Times and hasn’t been in any trouble since the murders happened. • During his confession, Daniel himself insisted that Rachel wasn’t involved. I think that Matt wanted to try to cover all the bases and be ready for whatever the defense was going to say. It appeared that he wasn’t taking any chances that the jury might blame Rachel and possibly not choose death for Daniel. Will the Orange County D.A.’s office emphasize Rachel’s good qualities when they have her on trial? 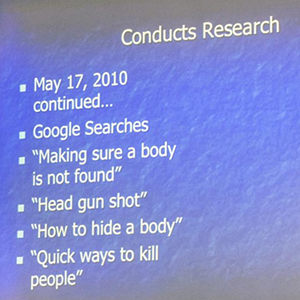 Next, the prosecution went on to remind the jury about a few of those Google searches, including the “making sure a body isn’t found,” and “head gunshot.” Matt wasn’t allowed to talk about the search for “Sirius” (This is probably because the brightest star in the night sky, also known colloquially as the “Dog Star” isn’t likely an important issue in this case). Then Matt summerized the testimonies of witnesses Chris Williams and Wesley “ATM kid” Frielich. The prosecution did not want the jury to forget about how emotional each of them had been on the stand. They both talked about feelings of betrayal and fear as a direct result of Daniel’s actions. All of this was Matt’s argument proving that Daniel Wozniak doesn’t deserve to live. The jury should see he is callous, self-serving, and that friendship means nothing to him. Murphy connected Daniel to his ironically similar character Guido Contini, in the musical Nine. The jury heard that while Daniel and Rachel were singing and dancing onstage, Julie’s and Sam’s families were in a panicked search for their loved ones. Matt Murphy went through the timeline again. He reminded the jury of Sam’s murder in the theatre attic. After that, Daniel started taking out some of Sam’s money. And to make it look like Sam was on the run, there was the plot to lure Julie to Sam’s apartment in order to kill her and frame Sam. Matt claimed Daniel knew that Julie and Sam were good people. He was aware they both had friends and family members who loved them, but he didn’t care. As he finished his opening arguement, Murphy wanted to convey to every one in the courtroom that today was for those friends and family. It was time for the defense’s opening arguments. Once again, Tracy LeSage took the stage. She started by telling the jury that the defense appreciated and respected the thoughtful consideration they used during the guilt phase. She also admitted that the defense was in no way trying to excuse or justify Daniel’s actions. However, she asked that they be fair to both sides, to please keep an open mind and look deep inside themselves, and to bring justice to the process. That was it. She didn’t really cover any more ground than she had in her closing for the guilt phase. As far as Daniel avoiding the death penalty, well…let’s just say I wasn’t hopeful (good thing, right?). Next up: The Prosecution’s witnesses and victim impact statements. You might want to have a box of tissues nearby.